Welcome to Throwback Thursday! I've labeled this as a "product review" because at its heart, it truly is a product review, however Thursday is reserved for reviews of products that I know I love and have been using for a long time; hence the "throwback". Thursday is for items that I wouldn't think to review otherwise because I've simply forgotten that anyone would need or want to know about them. So, if you stop by the blog on Thursday's, you'll be reading about products that I think are fantastic! 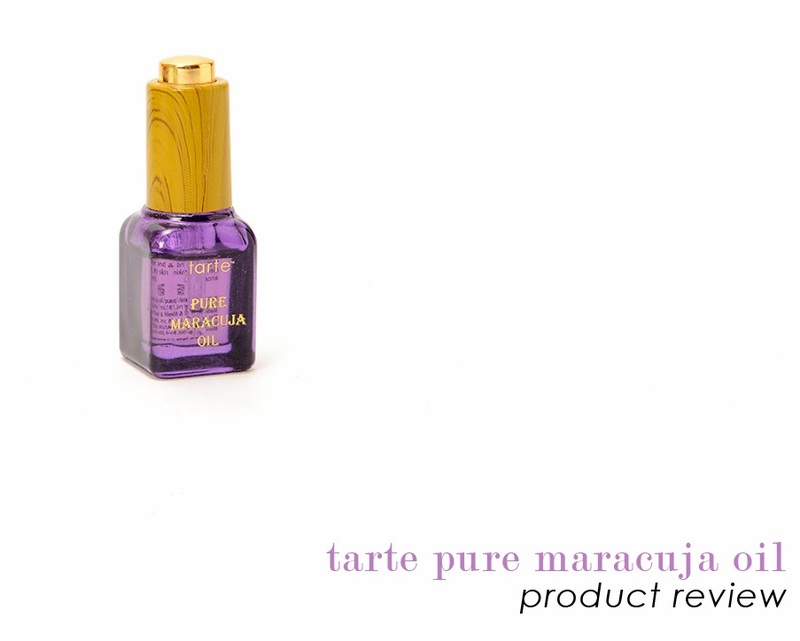 Today's topic is Tarte's Pure Maracuja Oil. If you've read this blog for a long time, then you would know that I typically identify as having oily skin except in the winter when my skin goes normal. You may be asking yourself why I'm reviewing an oil and why it would be a favorite of mine and the answer is very simple; oils are for every single skin type. Shocked? You might be, but I'll guess that most people that read this blog are already a bit familiar with that concept. I'm not going to dive into what types of oils are good different skin types because I'm not that well versed in the area, but I do know that maracuja oil is one of those that is fairly universally applicable types. What is it? Maracuja is just the fancy name for passion fruit seed oil. Tarte claims that this is 100% cold pressed passion fruit seed oil. What does it do? Directly from the Sephora website, "This undiluted organic and moisturizing maracuja oil quickly absorbs for firmer, brighter, smoother skin. Pure maracuja oil is rich in vitamin C, so skin appears instantly brighter and more radiant. The oil is also a source of essential fatty acids (EFAs), a requirement for healthy skin cells that the body cannot produce on its own. EFA deficiency can result in the breakdown of essential skin cells which causes skin to appear dry and aged. By supplementing skin with pure maracuja oil, you are infusing life back into dull skin and replenishing EFAs to rapidly rebuild and repair. This potent antiaging elixir that has anti-inflammatory benefits promotes active skin recovery and delivers maximum hydration without any greasy or filmy feel." And from Garden of Wisdom's website, "Passion fruit seed oil is rich with vitamin A and potassium to help keep skin healthy. As well as being nourishing, passion fruit seed oil is antibacterial, so is good for use on acne prone skin. As an anti-inflammatory and naturally anti-itch, this oil will help to reduce swelling and irritation of the skin. Passion fruit oil also contains ascorbic acid, β-carotene, calcium, flavanoids, phosphorus, and potassium. Passion fruit oil has been shown to reduce sebum secretion, promoting a drier skin feel, and is an excellent addition to anti-acne and sensitive skin care applications." Passion fruit seed oil is also anti-bacterial, which really helps in the anti-acne department (if that's what's causing your acne). If you didn't read any of the above, let me sum it up for you; packed full of awesome skin vitamins and fatty acids and incredibly fact absorbing on the skin. So, uh, how do you use it? This varies from person to person. I don't use this every day and mostly because I'm constantly trying out new products, but there are stretches of time that I really love using this. I used this pretty heavily at nights over the summer because it really helped to control my oil production. I normally wake up as an oil slick during the summer, but when I was using the Maracuja Oil, I would wake up with only a bit of oil sitting on top of my skin. I personally use this alone, but you can also use it in conjunction with another moisturizer if you have drier skin. I put two drops into my hands and then rub all over my face and wipe the excess off on my neck. Where to get it: You can pick up Tarte's version anywhere that sells Tarte products (Sephora, Ulta, Tarte.com), but it can be quite expensive. I've lucked out and gotten several deluxe sample sizes of it, but the 1.7 fl oz size is $46. If that pretty much blows your socks off, there are other ways to get passion fruit see oil. A great website, Garden of Wisdom, sells an ounce of it for $5.25 and if you want to get fancy and get it in a glass bottle, it'll take you up to $7.65. I've never used the Garden of Wisdom oil, so I can't speak of it personally, but I know that a lot of people use the site. So there you go, a great oil that I love to use! If you have questions of comments, please let me know down below.